It's your own private class with the legendary Bob Ross, host of TV's favorite art show The Joy of Painting! This is an amazing 10 DVD set, featuring nine one hour instructional sessions with Bob and covering these subjects: Peace Offerings of Summer, WinterGlory, Grandeur of Summer, Autumn Stream, Winter Harmony, Winter Nocturne, Seascape with Lighthouse, Times Past, Summer Reflections, as well as an additional one hour DVD Getting Started session. 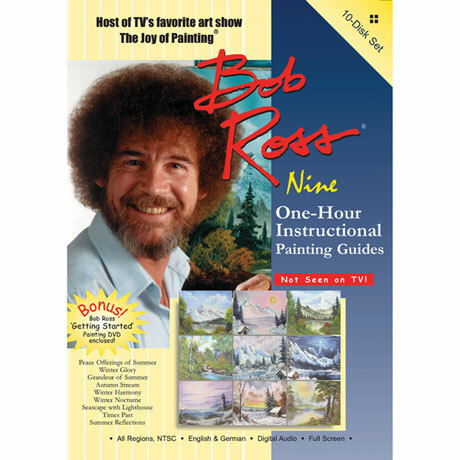 The paintings in these DVDs are designed as a guide to help you understand the Wet-on-Wet technique and are taught in Bob's famous warm and patient style.